Released in late June, a new report produced by the Aerospace Industries Association of Canada (AIAC) and the Department of Innovation, Science and Economic Development (ISED) describes aerospace as a national innovation leader. The two groups describe their annual report, called State of Canada’s Aerospace Industry, as an evidence-based, relevant, quality and timely analysis for both industry and government decision makers. It is largely based on Statistics Canada revisions of economic impact multipliers for the period between 2012 and 2017, including the measurement of jobs and GDP impact from the Canadian aerospace industry, its value chain, and associated consumer spending. AIAC’s findings show how aerospace remains as one of Canada’s most important manufacturing sectors, creating high-quality jobs, technologies and global trading relationships. In 2017, aerospace contributed nearly $25 billion in GDP and almost 190,000 jobs to the Canadian economy, according to the report. This is broken down by direct aerospace jobs at 86,000 (with a $12.6 billion contribution to GDP in 2017), Canadian suppliers to the aerospace industry at 58,000 jobs (with a $6.8 billion contribution to GDP), and consumer spending by associated employees at 45,000 jobs (with a $5.1 billion contribution to GDP). Close to 75 per cent of aerospace manufactured products in Canada were exported in 2017. Despite a slight decline in both between 2016 and 2017, the report suggests a positive five-year growth in its GDP (+six per cent) and jobs (+two per cent) contribution to the Canadian economy. 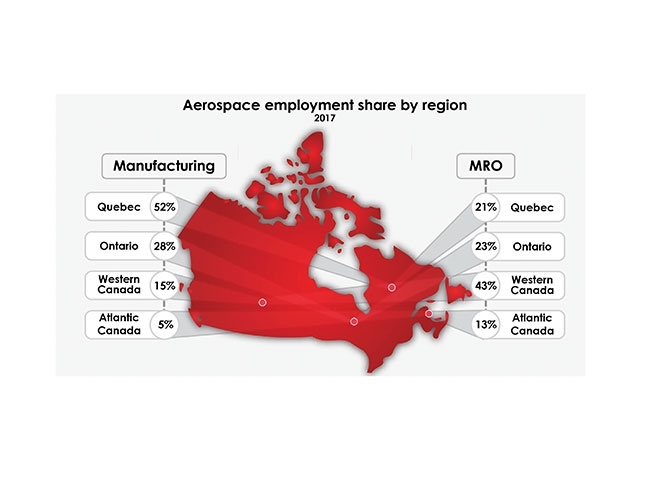 When breaking down aerospace employment share by region in 2017, AIAC found that Quebec continues to dominate the manufacturing side of Canada’s aerospace sector with 52 per cent of all activities taking place in the province, followed by Ontario at 28 per cent, 15 per cent in Western Canada, and five per cent in Atlantic Canada. In terms of MRO contribution, however, Western Canada leads at 43 per cent of all activities, followed by Ontario at 23 per cent, Quebec at 21 per cent, and Atlantic Canada at 13 per cent. MRO activity in 2017 grew by more than 25 per cent, according to the report, while manufacturing activity saw a slight contraction between 2012 and 2017. Some of the report’s most positive results show that Aerospace’s share of STEM workers is three times the national manufacturing average. Women make up nearly a quarter of all STEM-related aerospace jobs in Canada. AIAC also finds that Canadian aerospace is the national leader in innovation and R&D investment, spending $1.7 billion in 2017. The aerospace industry accounts for 24 per cent of total manufacturing sector R&D investments. This high level is put into perspective when considering that aerospace makes up only five per cent of Canada’s total manufacturing GDP). It is seven times more R&D intensive, according to AIAC, than the manufacturing sector average. On a global level, AIAC reports Canadian aerospace is first in civil flight simulation, third in civil aircraft simulation and third in civil engine production. I look forward to helping this impressive position. Leading Edge: A bold and exceptional future?